Asia Driving School offers automatic driving lessons in Sydney inner cities Eastern & Southern Suburb of Sydney with the best driving school Sydney reviews,Truelocal reviews,Yellow Pages & Google Places reviews. 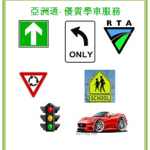 Asia Driving School (Sydney) offer high quality services at competitive price. It is Great Value for Money and Satisfaction Guaranteed. Make the right decision and let Asia Driving School (Sydney) be your first choice.